Apr 1st - Ok, a brand new month. I'm going to send Cami a copy of Alone In The Crowd and she's going to re-record the vocals in a studio. I feel it's only the quality of the recording that's letting this track down, so a professional studio should hopefully cure that. I'm also sending off my demo CD to FSRP as I still need to do that. Apr 2nd - Mailed a few CD-Rs to Michelle, Kelly and Sam, who you may remember wrote to me volunteering their services as my street team. Hopefully clubbers in Sheffield and Bournemouth will soon be more aware of my music. Apr 3rd - Started work on a new vocal commercial track. Between you and me, I'm hoping this will be the one that puts me in the chart. I've taken the advice of Dan who writes in my guestbook and I'm writing this track using the same kind of sounds that makes up the current chart toppers. It will still have my Square Bear feel to it though. Cheers Dan. Apr 4th - Bad news. I went to The Royal down Aire Street and saw that the DJ who supported my tracks has left! He's been replaced with a father and son karaoke team. That's one avenue of testing my new stuff gone. He was a great supporter of mine and it's a real blow to see him go. Apr 5th - Did a little more work on my new vocal track. It's coming together pretty well for just a couple of days work. I'm tempted to put a subtle scouse house "donk-donk" bassline in it but I don't know if that's becoming old hat now. I'll probably put a regular bassline on top and put the donk-donk in the background. Apr 6th - AARGH!! Found out that the vocal a "friend" had sent me for my new track is actually an acapella from an already released track in Canada. I wish they had told me at the time as I've just spent the last 3 days on this! I'm not a happy chappy. Apr 7th - Decided to continue writing the track anyway. I'll probably try to contact the original artist to see if they're interested but if not, I'll post it on my bootleg page. Apr 8th - Managed to find the owner of the acapella. It's by a group called Karma Club who are on the Robbins Entertainment record label. I've got their email address so when I've finished the track. If I'm still happy with it when it's finished, I'll contact them and see if I am allowed to do anything with it. Apr 9th - I've just heard the original of the Karma Club track and my version sounds almost exactly the same apart from the instruments used. I'll have to rethink this one. Apr 10th - Went to see the hard house DJ again. The crowd seemed to love listening to "donk-donk" all night and I must admit, he was pretty good. I might make a few like that and see if he likes them. That way it will be a new group of people that know my music exists and you can't have too much publicity. Apr 11th - One of the DJs who played out Jupiter Rose was Radio Aire presenter Alex Pepper. I know that he doesn't care much for Sean Paul and he doesn't like the scouse house "um-donk" bassline. So just for fun I put the two together and made a remix of Sean Paul's Get Busy. 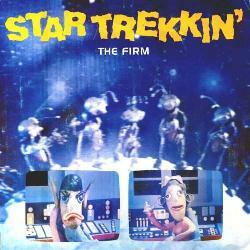 I uploaded it for him to listen to and he's set me a challenge to make an "um-donk" remix of Star Trekkin' by The Firm. I don't know if you remember it or not but it reached number 1 in the UK charts around the mid-eighties. If he likes it, he said he would make it his tune of the week! How can I refuse. Apr 12th - Started on the Star Trekkin' remix. It sounds good so far but it speeds up towards the end of the track which is fooling me for the moment. Apr 13th - Experimented a little with time-stretching to get the latter part of the track to fit. It's proving more difficult than I first thought and matching the ever increasing tempo is tricky. Altered the bass so it follows the original a lot more, rather than a monotonous "donk-donk". I uploaded a short preview and Alex seems to like it so far. Well it got a "lmfao" so I'm taking that as a good sign! Apr 14th - Worked some more on the Star Trekkin' remix. It was a popular track in the 80s and so hopefully this remix will also prove popular. I'd best try and find the original people who made the track and ask them if I can use it. Apr 15th - I've been a little frustrated that I can't do anything with the Beyonce remix I made due to legal reasons. Especially as most people like it and even AATW Records said that if it was legal they may have included it on Clubland 4. I was telling a friend of mine this and he suggested sending it to Klone records as they specialise in danced up versions of chart tracks. I'll look up their details. Apr 16th - I found the contact details to Klone and I've sent them a mail with a link to the Beyonce remix. Let's hope they like it. Apr 17th - Did some more on the Star Trekkin' remix. The second part of the song where it gradually speeds up is still proving difficult. I may have to alter it slightly if I can't get the backing beat to match. Apr 18th - I've just remembered I'm in a multi-genre competition. We've had to make a dance track and a beach scene so far. Now we've been given some vocals and have to write a song using them. I've got a track part way finished for it but I'd better complete it seeing as the closing date for this round is Friday. Apr 20th - Unfortunately, I've had to drop out of the multi-genre competition. I need to concentrate on this project if I'm going to succeed and I just don't have the time to make a new track each month for this contest. Apr 21st - Had a day away from making music and chilled out. This project is starting to become a bit stressful and so I decided to leave it for a day a relax. Apr 22nd - Ouch! I don't feel too good today. I suffer a lot with gout and today I can feel my foot playing up. Last time this happened, I ended up stuck at home for a week. Apr 23rd - Yep, it's come back again. My foot feels like it's on fire. Please forgive me if I don't update this for a couple of days as I don't think I'm going to be on the net this weekend. It's too painful to move around on it so I've just logged in to write this and now I'm going back to lie down. See you all soon. Apr 24th - Apr 27th - Well, I'm just about back to normal now after a few days off my feet. I've seen enough snooker on the TV to last me a lifetime! Apr 28th - Anyone heard of The Underdog Project? They've had a couple of chart hits in the UK at least. I've heard on the grapevine that their new song is called No More and they are looking for remixers. It may be just rumour but it's one I want to find out more about. Apr 29th - Still looking for any firm details on this. The only thing I've managed to find out so far is that it is a female vocal instead of their usual male one. Apr 30th - Next Friday (7th May) I'm going out with some of my friends to Selby as it's one of their birthdays. I haven't been on a night out there for ages and I've heard that there's a couple of new nightclubs opened since my last visit. I'm going to make sure that I take a few demo CDs with me to hand out to the DJs. I've got to keep promoting myself to as many people as I can and this is an ideal chance for a few more people to be aware of me and my music.